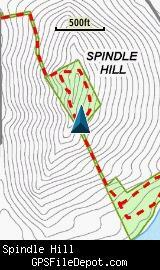 This KMZ map encompasses two small conservation parcels (one atop Spindle Hill and one just north of Wheeler Pond) that are joined by a 25 foot wide strip of conservation land. The 25 foot wide strip of conservation land continues north of Spindle Hill to Gates Lane. Although at first glance this area seems like it isn't large enough to deserve a KMZ map, recent reports indicate the trail is overgrown and not easily found. This KMZ map may help you to stay on the public land and avoid the private land of the abutting homeowners. 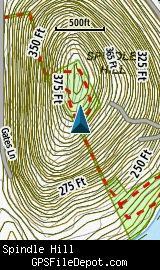 This KMZ map is set to Draw Order 35 so it will show 'beneath' the primary map on your Garmin KMZ-compatible GPS but 'above' my KMZ map of the Marble Hill area.